Semi-detached house with 3 double bedrooms, 2½ bathrooms, garden, terraces, solarium and allocated off-road parking. 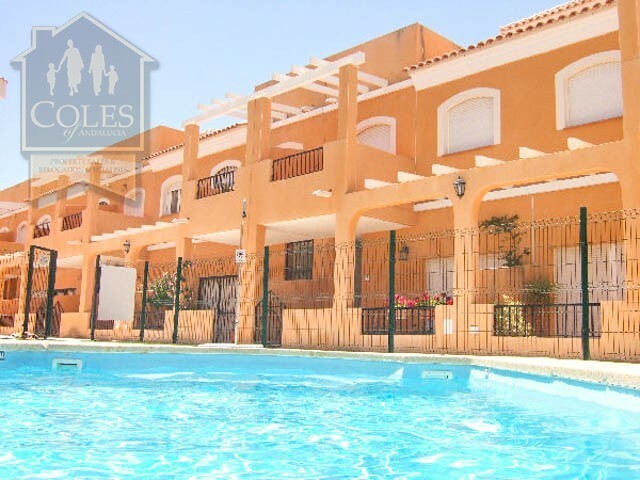 The well maintained and presented property is located on a development of 52 properties with communal swimming pool and gardens and also a private garden. With community fees at just under 40€ per month the property is relatively cheap to run and represents excellent value for money. Internally, the ground floor of the property comprises an entrance hall with wide marble staircase leading to the first floor; a bright living room with wall height picture window looking out to the garden and patio doors leading to an outside covered terrace; fully fitted kitchen with extended work tops and storage; master bedroom with en suite bathroom with bath & shower over, toilet, bidet and basin; and a guest w.c. The first floor comprises a landing off which there are two double bedrooms both with built in wardrobes and patio doors leading to a terrace and an external staircase to the solarium; and a second bathroom with bath & shower over, toilet and basin. The external areas include a roof top solarium taking in the excellent views of Mojácar Pueblo and the Sierra Cabrera; a first floor terrace; and a garden wrapping around two sides of the house. To the front, the garden is terraced to create a relaxing area ideal for sun loungers and to the side there is a pergola covered dining area. A short walk from the property there is the communal swimming pool that has recently been refurbished and had Roman steps and a new pump house installed. An allocated off-road parking space is also included in the sale. The property benefits air conditioning (hot & cold); shutters; built in wardrobes; gas powered hot water; and is being sold fully furnished.